More than 80% of travel related searches are looking for business reviews on directories. Add your listing and acquire more customers, ratings and reviews. You have the option to promote your business listing, or send customers to your listing page for a rating and review to grow organically. Turn your visitors into paying customers with exciting offers and services on your page. Add your menu, events, activities and catch the eye of potential Island travelers. These are just a few of the functionalities you get straight out of the box using Key Caribe Activities. To find out all the functions of our platform simply register an account with us and explore what we can do for your business. 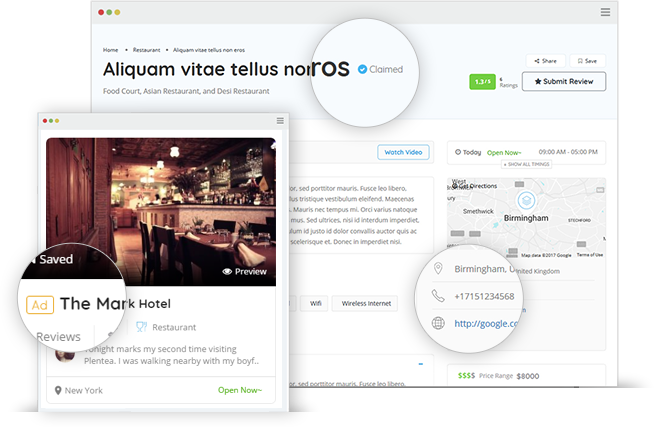 Easy to use interface to easily manage, update or add more features to your business listing. Gather customer emails, insights, reservations and more. Add your announcements, direct users to your website, or social media accounts. Offer incentives for customer actions. Schedule an event, promote it, redirect users to your ticket sale url or check-in page of Facebook. Get reservations straight from Key Caribe Activities. Set up your business listing with Resurva or Time Kit shortcode to get reservations straight in to your own reservation management system. Track user views, leads and customer reviews from straight from your dashboard, ordered and displayed in graphs by day, week or month.